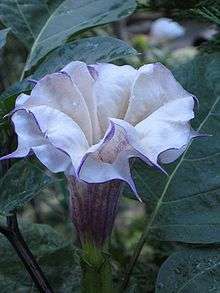 Datura metel is one of the 50 fundamental herbs used in traditional Chinese medicine, where it is called yáng jīn huā (洋金花). However, the ingestion of D. metel in any form is dangerous and should be treated with extreme caution. Leaf - Simple, alternate, petiolate, entire or deeply lobed, glabrous showing unicostate reticulate venation and exstipulate. Calyx - Sepals 5, green, gamosepalous showing valvate aestivation. Calyx is mostly persistent and odd sepal is posterior in position. Corolla - Petals 5, greenish white, gamopetalous, plicate showing twisted aestivation, funnel shaped with wide mouth and 10-lobed. Androecium - Stamens 5, free from one another, epipetalous, alternate the petals and are inserted inside the middle of the corolla tube. Anthers are basifixed, dithecous with long filament, introrse and longitudinally dehiscent. Gynoecium - Ovary superior, syncarpous and bicarpellary. Ovary is basically bilocular but tetralocular due to false septa. Carpels are obliquely place and ovules on swollen axile placenta. Style simple, long and filliform. Stigma is two lobed. Fruit - Spinescent capsule opening by four apical valves with persistent calyx. 1 2 3 Preissel, Ulrike; Preissel, Hans-Georg (2002). 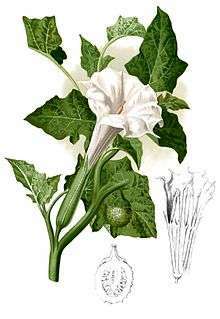 Brugmansia and Datura: Angel's Trumpets and Thorn Apples. Buffalo, New York: Firefly Books. pp. 120–123. ISBN 1-55209-598-3.